UK Garden Fencing Bowland House, York, United Kingdom, YO42 4PN, United Kingdom. We are a large company specialising in garden fencing and screening for both the trade, landscape gardeners and anyone who loves to garden. We carry huge supplies in the UK for next day delivery. Large and small orders welcome. Other garden fencings we have in stock are Bamboo Fence, Reed Fence, Heather Fence, Thatch Fence, Brushwood Fence, Fern Fence, Bamboo Cane Fence and Willow fence. We offer free advice. Delivery can be on a working day of your choice. We are open from 8.30am to 9.00pm seven days a week. Dimensions : 4 metres (13' 3") x 1 metres (3' 3"). This garden brushwood fence and screening will enhance all gardens, patios and deckings. It can be used as boundary fence or as a garden screen to create separate areas within your garden. When used over arbours and pergolas it creates a soft shaded area beneath for those hot summer days. Simply attach to garden fence uprights with ties or staples. Ideal cover to chain link fencing. Can be used to screen unsightly areas such as compost heaps, rubbish bins, gas and oil tanks. Delivered in a portable carry bag. Dimensions : 4 metres (13' 3") x 1.5 metres (5'). Dimensions : 4 metres (13' 3") x 2 metres (6' 6"). Dimensions : 5 metres (16' 6") x 1 metres (3' 3"). Dimensions : 5 metres (16' 6") x 1.2 metres (4'). Dimensions : 5 metres (16' 6") x 1.5 metres (5'). Dimensions : 5 metres (16' 6") x 1.8 metres (6'). This garden brushwood fence and screening will enhance all gardens, patios and deckings. It can be used as boundary fence or as a garden screen to create separate areas within your garden. When used over arbours and pergolas it creates a soft shaded area beneath for those hot summer days. Simply attach to garden fence uprights with ties or staples. Ideal cover to chain link fencing. Can be used to screen unsightly areas such as compost heaps, rubbish bins, gas and oil tanks. Delivered in a portable carry bag. 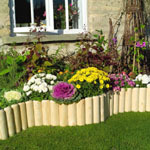 This brushwood fencing product is the perfect roll size for creating great privacy screening, and especially if it is covering old garden fence panels it is so easy to install. 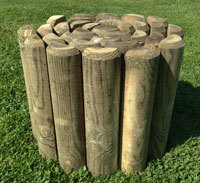 Garden landscaping couldnt be easier using this material as either garden screening or garden fencing. Your garden design ideas will come to life very quickly. Designer fencing at its best. Dimensions : 5 metres (16' 6") x 2 metres (6' 6").